Growing up the thought of Summer coming to an end was heartbreaking! And while I still live for longer days, sun-kissed skin and all of the fun travels that accompany Summer, there is something about crisp air, the changing leaves and cozy sweaters that have my now twenty-something self practically begging for Fall. It also doesn’t help that I work in an industry that’s always one season ahead and for months has been pushing new styles best suited for cooler weather (That and I’m excited to settle into a routine – does anyone else find that life is often more consistent in the Fall/ Winter months? Maybe we’re wired that way from years of attending school, which often meant more structured day-to-day’s). While I’m dying to wear new stylish jackets, sweaters and slacks now, it would look ridiculous in the sweltering heat. 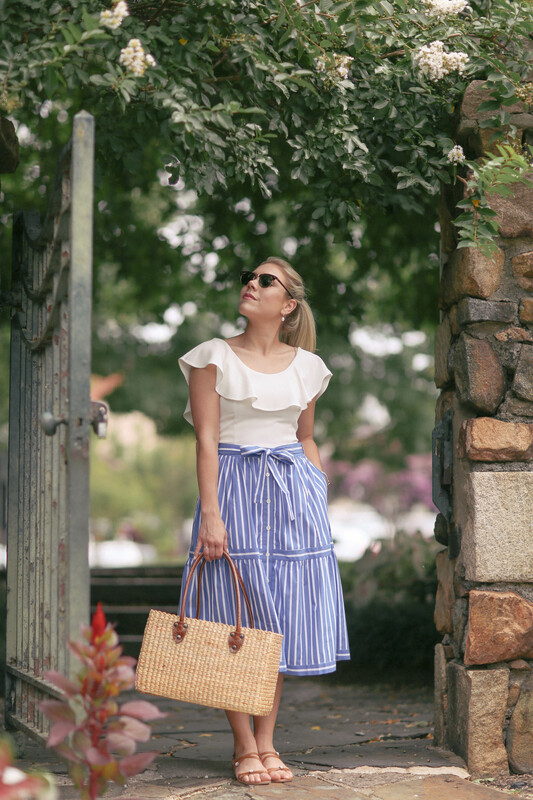 Being in Carolina’s, it is likely that we will have another month of warm weather, so satisfy my pre-Fall cravings I’m investing in pieces that are light enough to wear now and also perfect for layering in the season ahead. 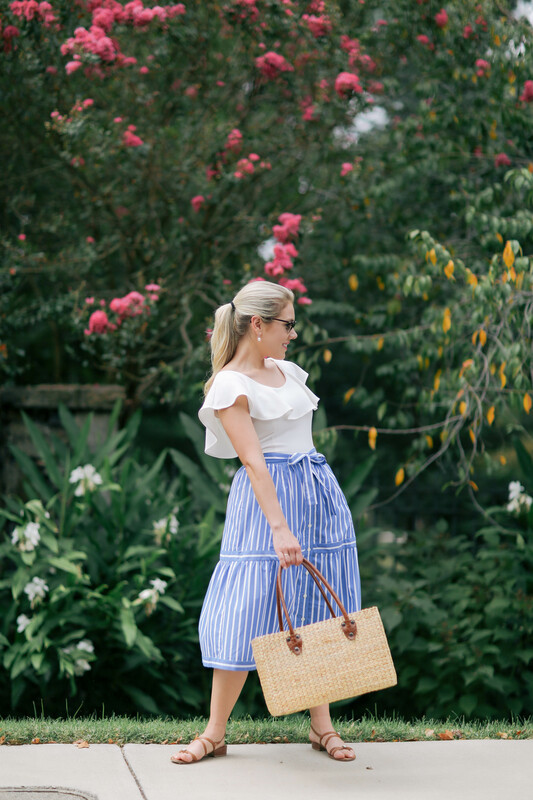 Several weeks ago I purchased this stripe midi skirt from J.Crew’s newest collection. It’s would pair beautifully with a cream sweater come Fall, too. To satisfy your pre-fall cravings 🙂 I’ve linked beautiful pieces below that are easy to transition. Some key trends to look out for are: velvet, check print everything (especially blazers and trousers), oversized jackets and blazers (borrowing from the boys), dressier tops with relaxed denim, denim on denim and bell-sleeved sweaters & coats. To help you spice up your wardrobe just in time for Fall, I am teaming up with a handful of influencers to give you the chance to win a $600 Nordstrom gift card! I’ve included a link below in which you can enter. If you have any questions as to how to enter feel free to send me an email at: taylorrae@stylesouffle.com. Love this type of skirt but they look AWFUL on me! 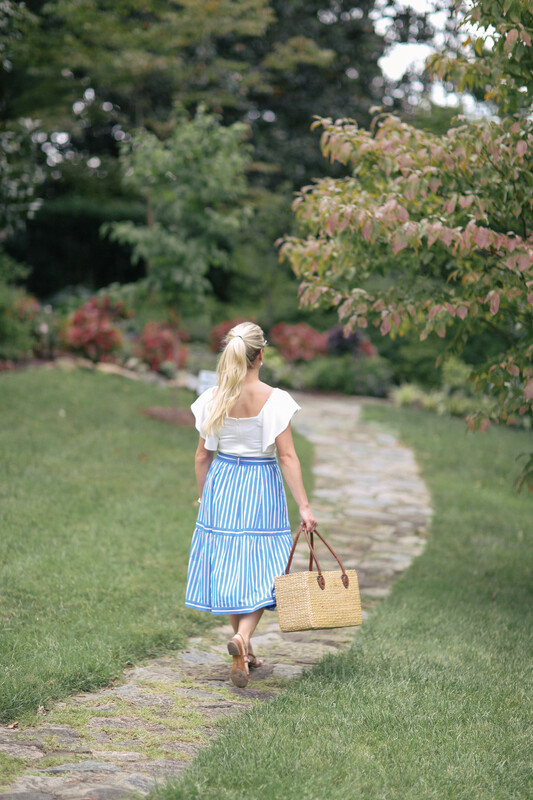 So envious of this pretty summer look on you. And yes fall always seems more structured. I think it’s the impossible impromptu pool days that help make it more structured ha! Okay this is way too cute, going to check it out now! I love that skirt, especially paired with that top, it’s so pretty. And perfect for fall too! I love the fall picks! 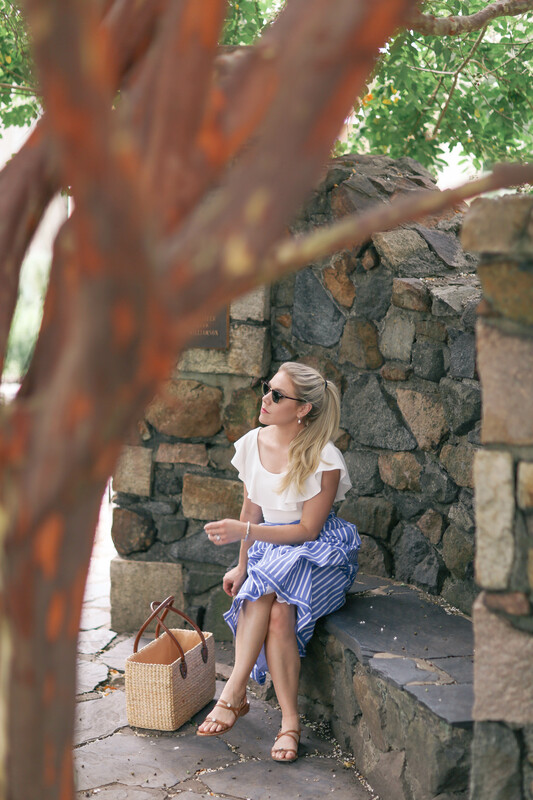 I’m truly swooning over this darling outfit. 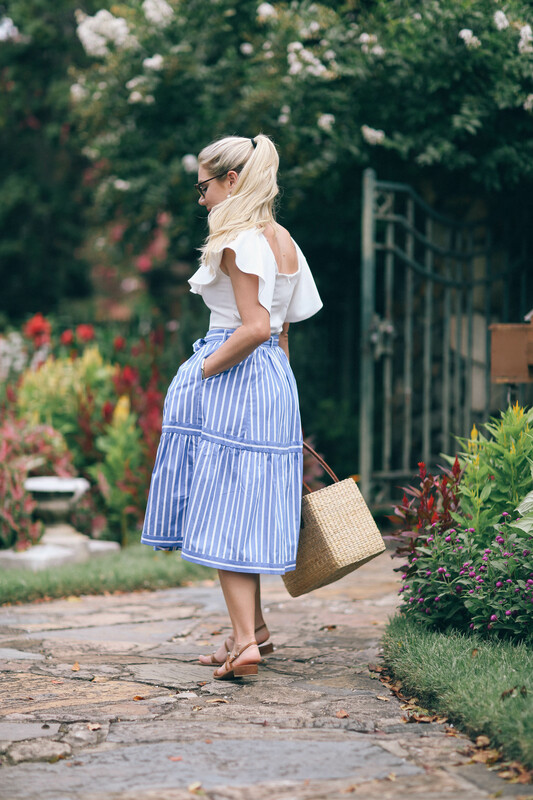 Midi skirts became my jam during the summer, and this entire look is so elegant and chic. Very Hampton’s! You have spectacular style! I can’t wait to see what you have in store for fall – my favorite season! This skirt will be such a good transitional piece! 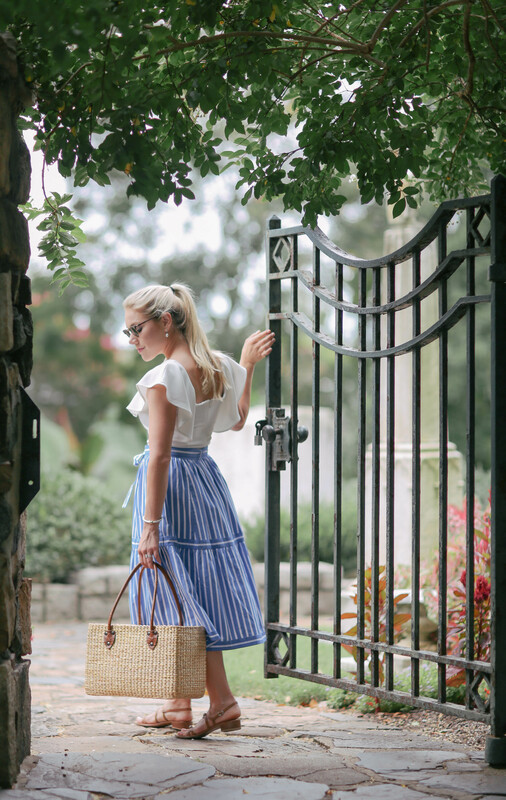 I love anything with blue and white stripes so this has me seeing all the heart eye emojis! You look incredibly, girl! 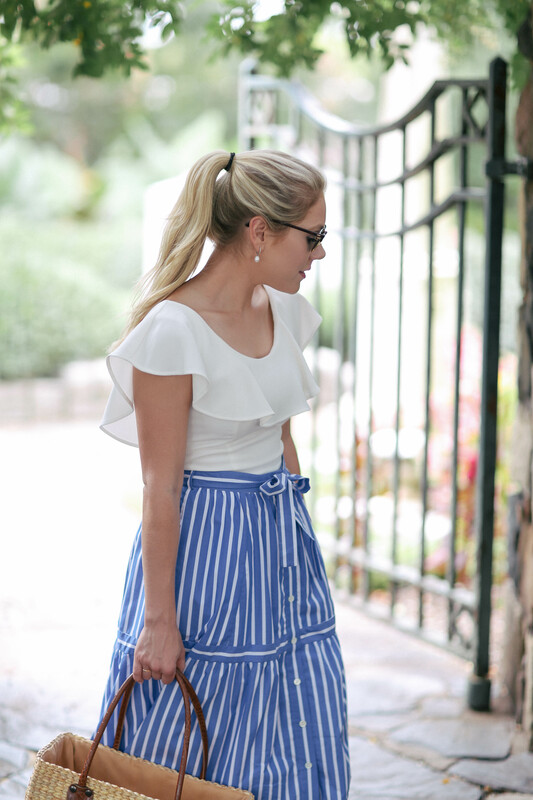 This skirt is absolutely adorable and goes so well with your top. How cute is this skirt! It was definitely a great buy! This skirt is SO cute! 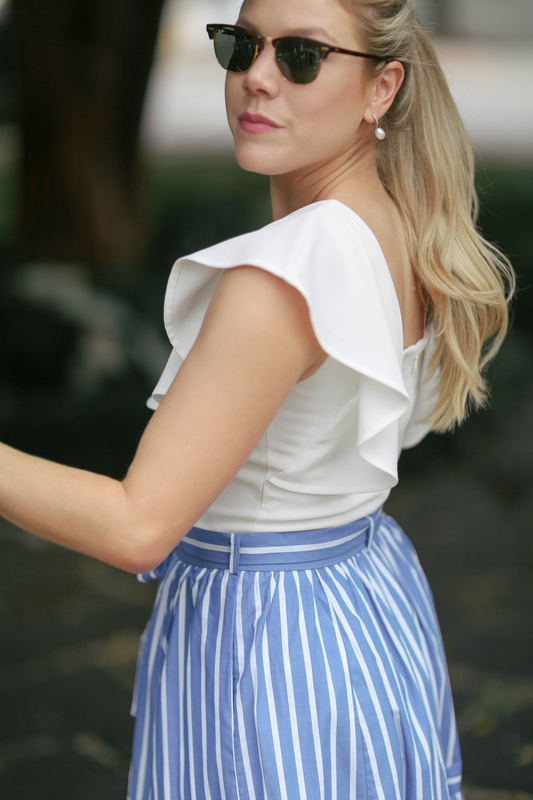 I love the blue and white as it’s such a classic for any season! this is such a perfect outfit on you Taylor!